I finished the Australia journal case. 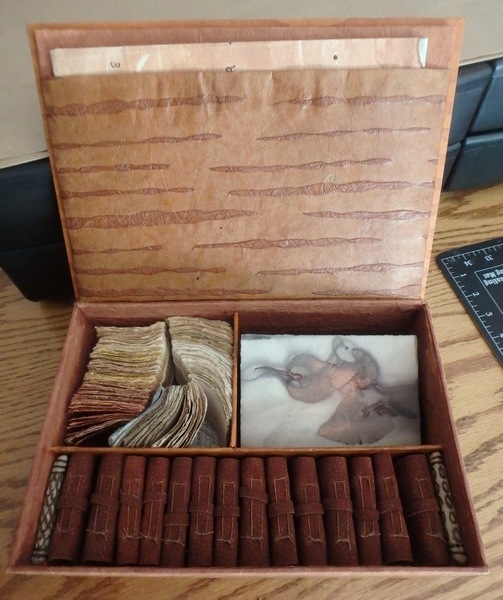 It ended up being a box because of how everything would fit and be protected. Here on the cover I used a watercolor I made of Tasmania’s soils turned into watercolors and my own colors from North Carolina making tracks through the land. 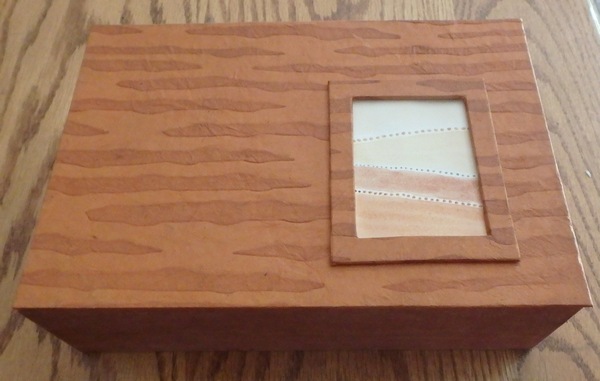 The box is about 11″ x 8″ x 3.5″. Here it is opened. 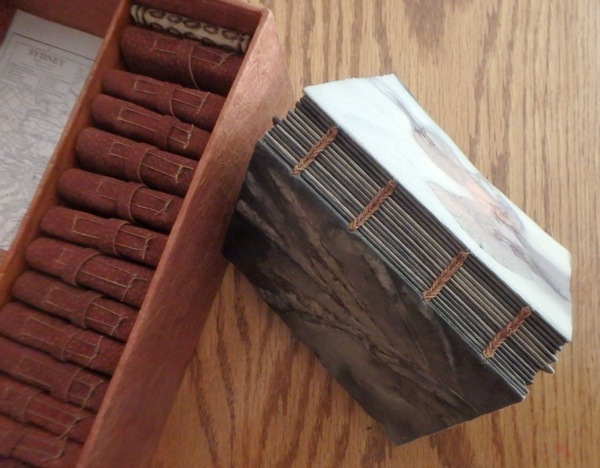 The map is folded and placed in a built in pocket inside the lid. 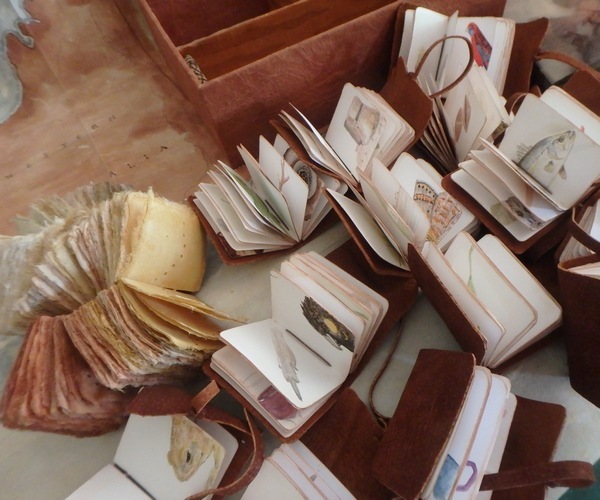 The small leather covered journals line up between added walls with the small burned driftwood sticks made by Toni Rogers in Queensland. The sienna toned papers were purchased in Australia from my favorite paper vendor at the conferences. The one that lines the box and covers the outside is a leather-feeling one that is not easy to find here in this country. 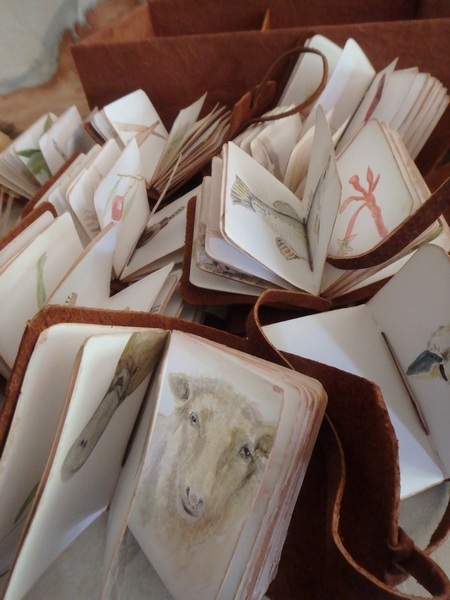 The coptic bound book of botanical impressions was made at Beautiful Silks. 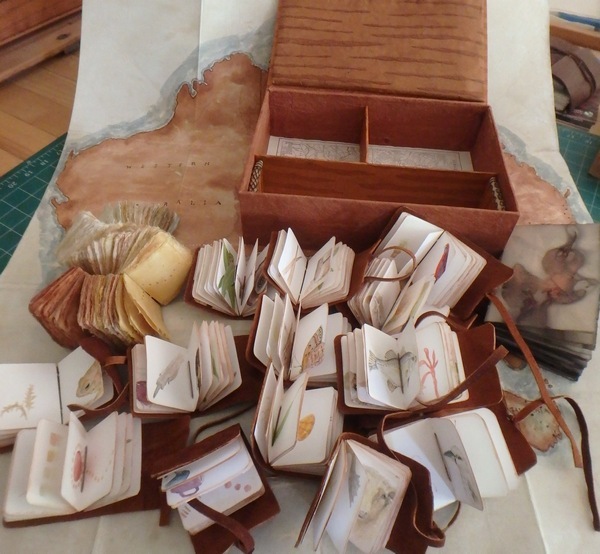 Each folio is stitched individually. 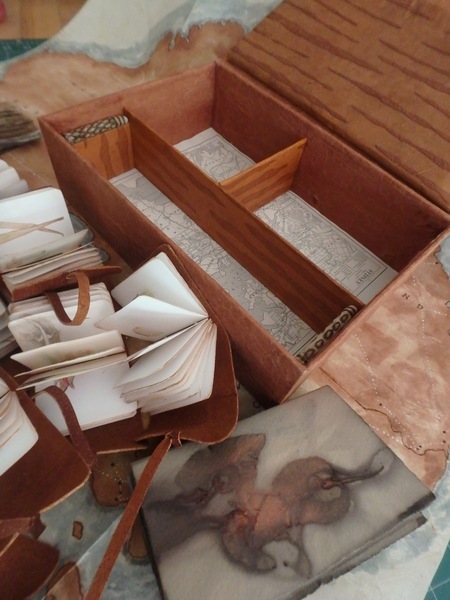 The paper that lines the bottom of the box is an old map of Sydney….the welcoming place for people coming into the country. Here you can see more of the city map and end walls supporting Toni’s small sticks. Everything comes out and is placed on the map. I love the tumbled-ness of how this looks. Each piece is about taking a closer look of what was seen in the country, and what caught my attention for further documentation. I had a chance to get away for an overnight in Asheville with friends and a terrific dinner out starting with a cucumber/basil martini, then watermelon whipped feta/strawberry salad and finally seared tuna that is so hard to get here where I live. So this wraps up the final work I will do about Australia. It has been such a thrill to revisit the country this way. Heading back in March 2019 is anticipated with just as much enthusiasm. Another topic later this weekend after company goes back home and we get back to the new normal.